Basically, rice has a higher per unit yield than wheat, but requires a lot more coordinated labor input. To grow paddy rice it takes a village. This insight was not surprising to me, and introduced in David Sloan Wilson’s Darwin’s Cathedral: Evolution, Religion, and the Nature of Society. 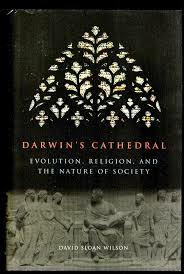 In this book Wilson argued for a rehabilitation of the tradition of evolutionary functionalism in the social sciences. Basically, viewing human societies as adaptive functional units. One of his examples to illustrate the necessity of examining group-level function was wet-rice paddy agriculture in Bali, which was only feasible through coordination and collective action between interdependent farms. The 2014 results made total sense to me in light of what little I knew. Southern Chinese are stereotypically more patriarchal and clannish than Northern Chinese. My inference here being that the collectivist nature of rice agriculture meant that paternal clan units of social organization were more important in the South than the North. I haven’t followed up on this work at all in all these years. Then I saw this on my Twitter feed: Teens in Rice County Are More Interdependent and Think More Holistically Than Nearby Wheat County. The authors utilize a natural experiment, a district in the northern province of Ningxia which through a peculiar geological quirk allows for wet-rice agriculture, unlike the rest of the province and the broader region. This is a natural “control” for many variables, as the people of this district are not demographically very different other areas of Ningxia (at least in comparison to North vs. South China). China’s smallest province Ningxia sits in North Central China. Surrounded by herding cultures to the north and wheat farmers to the south, Qingtongxia is a small outpost of rice farming fed by the Yellow River. We test the hypothesis that rice-farming cultures are more interdependent by comparing high school students from Qingtongxia (N = 190) to students in a nearby wheat district, Yuanzhou (N = 223). Comparing two nearby counties provides a natural test case that controls for third variables. Students in the rice county thought more holistically, treated a close friend better than a stranger, and showed lower implicit individualism. Students in the rice area showed more relative perception than students from the wheat areas on the practice trials of the framed line task, but differences were nonsignificant on the main trials. Differences between teenagers—born after the year 2000—suggest that rice–wheat differences continue among China’s next generation. One can make a Marxist interpretation of these results: the material conditions determined aspects of economic and social organization which had cultural and psychological consequences. But, the authors also suggest that younger generations which do not engage in farming continue to exhibit the same differences as their agriculturalist parents, suggesting that an element of cultural transmission from prior generations maintained particular folkways and dispositions. 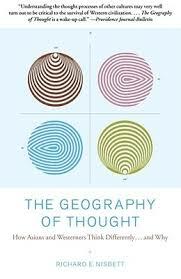 A final note: a few people reading this know that 15 years ago I read The Geography of Thought: How Asians and Westerners Think Differently…and why. The title is a little deceptive, as the author focused on three basic groups in regards to cognition. First, Anglo-Nordic people, who were highly individualistic. Second, Continental Europeans, who were somewhat less individualistic than Anglo-Nordics. And finally, the whole rest of the world, which was less individualistic still. But a lot of the data to construct the contrast was drawn from East Asia. And, I specifically remembered results from Hong Kong. If the above results are correct, it could be that biased sampling in Hong Kong, as well as South Korea and Japan, may have amplified our perception of the importance of “rice psychology”, if that makes any sense…. How did the Chinese get their genetic structure? Is there any reference to genetic differences between those Chinese communities? Not saying that genetic differences are the main cause, but those should be considered, especially since disparate developments of these two groups are pretty old. Most interesting would have been a communities which switched to the other subsistence at different times in history or prehistory. To document effects on culture and genes. How about Chinese from rice areas in the United States? How much and fast are they changing? Obs: Would the genetic differences be a cause or an *effect* of these behavioural differences? An individualistic “rebel” kid in a communitarian village can end up exiled or stoned to death. In a more individualistic community, if he’s halfway bright then he’s raised to chief of the war-band. Fully agree, social selection because of cultural rules seems to be largely neglected so far, but might have had a huge impact. In the Chinese example with rice vs wheat based subsistence we are talking about thousands of years and subpopulations with different genetic backgrounds from the start. There is a general Western bias towards Southern Chinese being seen as “the Chinese”, because of their dominance as immigrants and business. Even physically the differences are significant, at least on the group level. They Northerners seem to be more calm and introverted as well. In their extremes its like North Eastern Europeans vs Southern ones. I could experience it first hand recently with students and tourists from Northern China, which are quite different from the majority of Southern Chinese living in the West. There is a big overlap individually, but not for groups of people. I wonder about the Northern rice farmers in the study and whether they migrated there from more Southern parts of the country or not. Makes a difference for social selection as well if they lived in that cultural frame for hundreds or thousands of years. 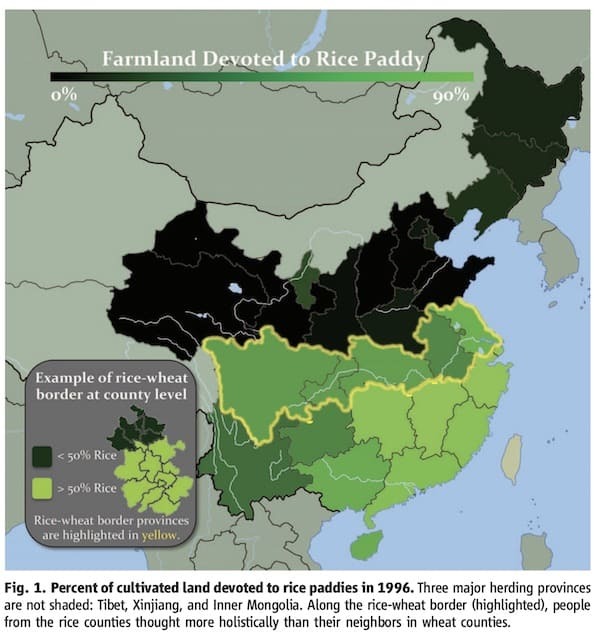 The one thing about Talhelm’s research program that I find interesting… several years ago he mentioned in an interview that he was retesting this in India, where the rice/wheat divide is more of an east/west thing. Several years later I am still waiting for those results. I have wondered: did something happen to corrupt that data or make the Indian experiment fall apart? Otherwise, why haven’t we seen it? would have to be a strong force. chinese are not that differentiated. lots of migration from north to south and back in last 2000 years. yeah, more work needs to be investigated about rice farming in that district. but it doesn’t seem like they are southern transplants. see the supplements. 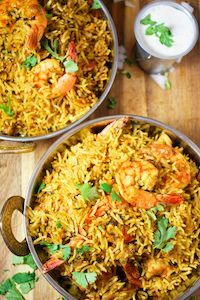 It would be interesting to see if this rice versus something else cultural difference played out in other areas of the world. South Carolina used to be a huge rice producer, but given that this was within the context of an enslaved society, I think it’s fair to say it may not be a great (or easy) comparison to make. But South Carolina didn’t get its slaves from China, they intentionally collected up people from the rice producing regions of Africa. Rice cultivation in Africa goes back a long way. I gather it goes back as far as 3500 years in the Niger River delta. Presumably long enough to make a cultural impact. Interesting. But, there are a number of problems with modeling social and psychological results as being caused by environmental factors. First, there is causation. Does rice farming cause clannish behavior or do clannish people become rice farmers to support their preferred lifestyle? Second, there are cross cultural comparisons. It has been posited that the differences between politics in England and in Germany are based on differences in family structure. Social scientists have identified persistent differences in family structure between the two countries. In the former, most families are nuclear families where the parents and children only remain together while the children are growing up and, on marrying, or even on reaching adulthood, children leave the parental home, and authority. By way of contrast Germany has tended towards a system where familial authority is strong, the eldest son does not leave the family home when he is married and remains under the authority of the father, and unmarried adult daughters remain in the family home under the authority of, first, their father and then their brother. 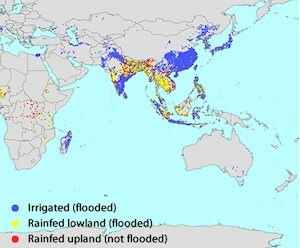 It it hard to imagine an environmental difference between the two societies that is of the magnitude of rice vs wheat. Wheat vs rye, just doesn’t cut it. “America, England, Europe – Why Do We Differ” by James C. Bennett and Michael J. Lotus in the Hungarian Review, Volume IV, No. 6, 28 November 2013. “Family Types and the Persistence of Regional Disparities in Europe ” by Gilles Duranton, Andrés Rodríguez-Pose,and Richard Sandall in Bruges European Economic Research Papers, BEER paper No. 10, March 2007 . The main thing with England is that the English being a colonised people. When the Normans conquered England, they created a system which was unique and which neglected most of the traditional customary law. They could reshape a country with brutal force. Especially in family matters church law was quite strict, much more strict than in most of Europe. Everything was structured from the top down and the commoners and small aristocrats had much less rights than in continental Europe for a crucial period of time. Individual rights of later times being the result of oppressing, even destroying community and kin rights first and creating a rigorous administration and legal system of the state. The difference to Scottish highland clans is quite evident. As for the original topic, its not just about rice farming alone, but the way you do it and the structure of the villages I guess. You can see huge differences among wheat farmers too. For example how close are houses, fields and families? How big are the families which share one large or many small buildings? Are you constantly under social surveillance of the whole village, or are you working more on your own? Looking at a Tell settlement and comparing it with single farm buildings in dispersed settlements, its quite clear to me that these different settlements must produce or represent a different culture and way of looking at the world. Especially if we are talking about long time intervals and many generations, social selection will work in different ways on the inhabitants as well. I am not sure that the Normans neglected English law to the degree you think. William came under a claim of being the lawful king of England at the top of an existing legal system. One of the important things his son, Henry I, did was confirm the good old laws of Edward the Confessor, the last Anglo-Saxon king who, it is easy to forget, was himself half Norman. It was under Norman kings, particularly Henry II, that the common law begun under Alfred the Great grew magnificently. We still have common law in England and all of the US, except Louisiana, and all of Canada except Quebec. @Walter Sobchak : You might be interested in the paper by Schulz et. al. that was published this summer on the origin of WEIRD psychology, it could point to an answer to your question (duration of the influance of the Catholic Church). Wouldn’t that imply southeast asians as being more collectivist than northern chinese? I don’t know how you would quantify these things (i guess i should read the paper haha), but filipinos don’t strike me as more collectivist than northern chinese (although not individualist either). Confused by some of the commentary. No one gets stoned to death in Chinese villages. “They Northerners seem to be more calm and introverted as well.” No. Anyone who has traveled widely in China would regard the description of Northerners as calm and introverted as a huge joke. Maybe you are comparing recent arrivals from the north with southern Chinese who have been in America for a while, I don’t know. They are not like that in China. Northern Chinese are much more gregarious outside of their family groups than e.g. Cantonese and Fujianese, and they are characterized by the Chinese themselves as being open, friendly and LOUD, compared to southerners who are characterized as clannish, suspicious, secretive and unfriendly to outsiders. My own family by marriage is northern, and they are stereotypically open, friendly and very loud and boisterous, compared to Cantonese – but that’s by Chinese standards, not Western standards. It’s relative. Northerners also tend to be larger and more robust physically – very noticeable once you move north of the rice producing belt. “Does rice farming cause clannish behavior or do clannish people become rice farmers to support their preferred lifestyle?” To someone who knows China, this comes across as kind of a dumb question. Northerners would dearly love to farm rice if they could, because yields are higher and it tastes better. They regard rice as a luxury good. “I’ve heard the stereotype of Southern Chinese being more patriarchal may just be Fujian specific. Sichuanese and other Southwestern Chinese seem more egalitarian.” What you’ve heard is wrong – you have left out the Cantonese, who are very numerous, and the Hakka who span Fujian and Guangdong. “filipinos don’t strike me as more collectivist than northern chinese” – they are in my personal experience, which is a lot. I don’t mean to be rude or offensive, but this commentary generally seems like a lot of opinionating in the absence of evidence or lived experience. @Young: The Anglo-Saxon church was completely purged and the new aristocracy was forced to accept church law, even more so the common English people, in an unprecedented way. William needed, or at least wanted, the full support of the Pope. You can see huge differences to other organically grown Northern European countries in the way church law was implemented in practise. In England demands of the clergy were realised like nowhere else at that time after the Norman conquest. @John: What is your impression of the relationship to the state of Northern vs Southern Chinese? Law-abiding behaviour, corruption, patriotism, trust in state institutions etc? @Obs: I don’t have personal observations of modern people to suggest that one is more law abiding, etc. than the other; that is, I have not noted any obvious differences between the two. Traditionally the south was always regarded as more rebellious, but I haven’t noted that reflected in modern China at all. EXCEPT that, the first time I travelled in China in 1982, women in Guangzhou were wearing colourful clothing, while by the time I got to Shanghai and parts further north they were still all wearing the drab blue or green Chairman Mao type suits and caps. Trivial example, maybe, but it was perhaps some kind of evidence that women in the south seemed to feel under less pressure to conform. All of that has now long been swept away, obviously. I have, I believe. For a little more than a year I lived in an almost entirely black, low income, neighborhood. I had previously lived among very poor white neighbors and not experienced any significant rise in criminal behavior. In fact, many took considerable pride in their honesty. I expected the same in the black community but, instead, saw a breathtaking level of criminal behavior. I put it off as a social pathology unique to that neighborhood rather than to a particular ethnic group, but then I could not help but take note of the level of crime in places like New Orleans, Baltimore, St. Louis and the rest in America and, for that matter, many cities in the UK and Europe, and, of course, the level of crime in most African countries. I cannot say that any of this is due to a genetic predisposition–I don’t know–but it is foolish to pretend that the difference does not exist, whatever the reason. @Young – I was specifically trying to answer Obs’ question to me about differences between modern northern and southern Han populations as helpfully as I could (which was not very), not making some observation about human groups in general. That’s the point I was making, no contradiction. He helped the church to get through with their vision of individuality, family law and kinship degradation. He did so because that was the price he paid for the support of the church. The effects last to this day and made the West different than it would have been otherwise. 1) Re: rice vs wheat and collectivism, might be worth looking at rice and wheat agriculture conditional on agricultural wage differences. There’s also some fairly good evidence that individualism tends to increase with higher real wages, at least in stable societies (changes in WVS data for’ex). In theory, perhaps because wealthier individuals are more able to exercise autonomy / less dependent on group? Talhem sort of looked at GDP/cap as I recall, but I think this was present GDP/cap, not past GDP/cap. He’s looking at the modernization hypothesis, well, OK, but long run wage differences may be important if there’s a limit to culture shock change per generation. There is certainly a trend line of the holistic vs categorization showing some correlation with rice paddies as % cultivated land. But the big outliers that reinforce the trend seem like Jilin, Gansu, Yunnan, Qinghai, Ningxia, Guizhou. They mainly look very “frontier”. Looks like the north core states doesn’t really separate from the south core states as easily as the frontier does from the core. 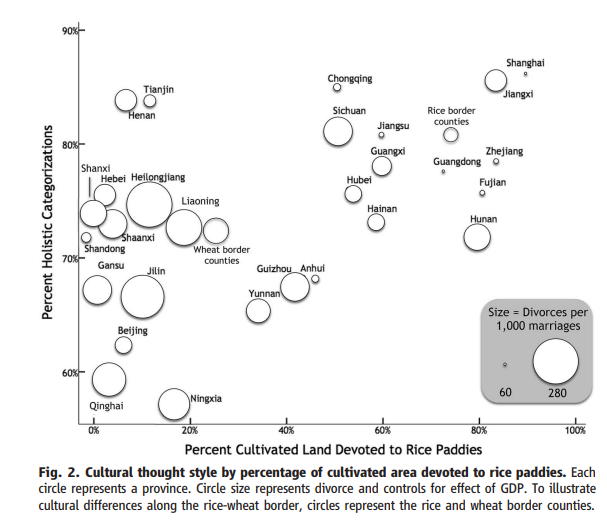 (% rice paddies also seem like a slightly dubious variable. Yunnanese and Gansu people necessarily wheat farmers ‘cos % rice paddies relatively lower?). Pedantry on my part but it induces irritation in me that I can’t block: ‘rice paddy’ is meaningless tautology; it means ‘rice rice’. ‘Paddy’ (from 17th Century Malay word ‘pādī’) means unmilled rice. So, should actually say ‘paddy fields’. Can’t just say ‘paddies’, because paddy refers to the growing or unmilled harvested rice, not to the fields it is grown in, so ‘paddies’ would be meaningless. Pedantic carping over; please carry on. John Massey, time marches on. People also say ATM machine, but ATM means Automatic Teller Machine. Roger Sweeny, how fast it marches and in which direction depends on where you are. I have only heard/seen Americans use the term “rice paddy”, no one else, and where I live, an ATM is called an ATM (in English). John Massey, you are one smart dude. Seriously Salut! You remind me of people I use to know. Chinaphile and Asiafile and proud of it. I use to follow China much more closely years ago. Many that I trust have now say they are concerned that Chinese openness,pluralism and plutocracy (full disclosure: which I am a fan of) might be beginning to recede under Xi Jinping. Personally I am not convinced and still believe that China’s slow opening might continue. Talhelm, T., & Oishi, S. (2018). How Rice Farming Shaped Culture in Southern China. In A. K. Uskul & S. Oishi (Eds. ), Socioeconomic Environment and Human Psychology (pp. 53–76). New York, NY: Oxford University Press. I want a side of pasta with that risotto. If you get this reference, you have a good taste in movies. AnAn: A year ago I felt comfortable that everything was heading in the right direction. Now I am not so sure, so I’m just watching what happens closely and not making any predictions. That’s strictly in relation to the Mainland, so to that extent it’s academic for me; I have no concerns at all about Hong Kong or my personal or family situation. “A year ago I felt comfortable that everything was heading in the right direction. Now I am not so sure” Several people I trust who know a heck of a lot more about China than I do say as much. I hope they are wrong. Agreed, I remain an uber optimist about Hong Kong. John Massey: I was quoting the responses in the Reddit thread I linked. From my very limited anecdotal experience, recent Guangdong and Fujian immigrants seem more clannish, but that could reflect their more deeply ingrained culture of chain migration.